Hand Grip positioning tends to take several hours of riding to figure out what works best for the Rider. Arms and wrists aren't worked as hard as legs and knees so the points of fatigue don't announce themselves on shorter rides. Often at the end of a ride the Rider has other things on their mind like food & drink and the next time they ride making some minor Hand Grip adjustments may not be on their mind. Be aware of that and the next time you finish a ride take some notes if you have any doubts at all about your Hand Grip positions. Where this topic is dedicated to the hand & wrist positions its going to be closely linked to Controls Positioning. You may want to read over both topics to fully appreciate what you're expecting from your arms, wrists and hands. As there are a few different steering system designs we'll focus on Direct and Indirect systems. The model above shows the ideal controls position for most but not all Riders. The rider has to steer, change gears, brake, and rest their arms particularly between any strenuous climbs or series of hard turns. Many riders use their arms to balance their torso whether its fore-aft during pedaling or side to side through turns. Everyone has a personal technique with the use of their upper extremities. Its valuable to understand how your upper extremities work when looking at the model to better understand most comfortable positions. This image reveals that Seat Angle has a profound affect on the distance from the shoulder to the Hand Grip. Keeping the hand slightly more elevated then the elbow helps the return of blood circulation which keeps the finger and wrist muscles supplied with enriched blood. Wrist motion is 2 dimensional and for most people the center of motion is between 2° and 6° down from the axis of the arm as shown above. That center point is generally the most comfortable position, particularly with the complex 2 dimensional motion that's involved. The axis of motion as shown in the Handgrip Angle to Forearm is referred to as "Pitch" and the twisting motion is referred to as "Yaw". Elbow motion prefers to be 1 dimensional like a hinge. Your elbows don't flex side-to-side although they do allow the forearm to rotate. When you steer your arm is rotating at the shoulder and puts a side load on the elbow as the elbow "hinges". Simple, lightweight and elegant Direct Steering provides a highly responsive input. Steering input mostly from the Deltoid muscle groups that twist the arm at the shoulder. The wrist will twist with Yaw more then angle with Pitch. 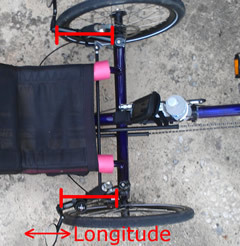 Generally Direct Steer trikes have 3 adjustments: Latitude, Longitude & Span. Some Direct Steering systems may have a height adjustment and in some cases it may be possible to add a Stem Extender to raise the height. Longitude is perhaps most crucial as it sets the overall distance from the shoulder and sets the angles of the wrist Pitch and elbow. If the Rider is at the end of the limit of the adjustment keep in mind that Latitude and Span may cause some interference with the Longitude at either extreme. 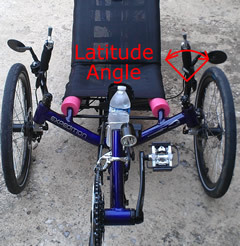 Latitude allows for the forearm to be in a natural position of rotation and provides clearance from the tire at extreme settings of Longitude and Span. If you wear rings particularly with any precious stones you'll want to be double wary of letting the gem hit the tire at anytime during a ride. 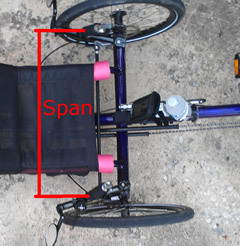 Span is the distance apart and is usually adjusted at the bar fastens to the spindle. Narrow Span settings bring the Hand Grips in closer to the rider however they also may limit the turn radius. Its much better to give up some of the turn radius then to adjust a less comfortable Latitude/Longitude setting. Most Hand Grip Bars are long enough that the Grips can be moved up or down by about an inch. Among the Indirect Steering units are Under Seat Steering (USS, most common), Tiller (Windcheetah) and standard Handlebars found on some Delta Trikes. We'll focus on the USS Hand Grips. Slightly more complex and less responsive Indirect Steering also offers a more linear feel to steering with improvements to the ergonomic feel for most people. Steering input is mostly from the Triceps/Biceps muscle group which also tends to have finer motor skills. Wrist motion is predominantly in the Pitch direction with hinged elbow motion. Hand Grip position adjustments for USS systems at the least allow some combined Latitude angle tilt/Longitudinal distance allowance as the entire handlebar assembly is clamped onto a handlebar stem. On nearly all, the stem is custom made however on the HPV Gekko standard stems are used and can be interchanged with longer/shorter stems to offer a range of Latitude & Longitude adjustment. 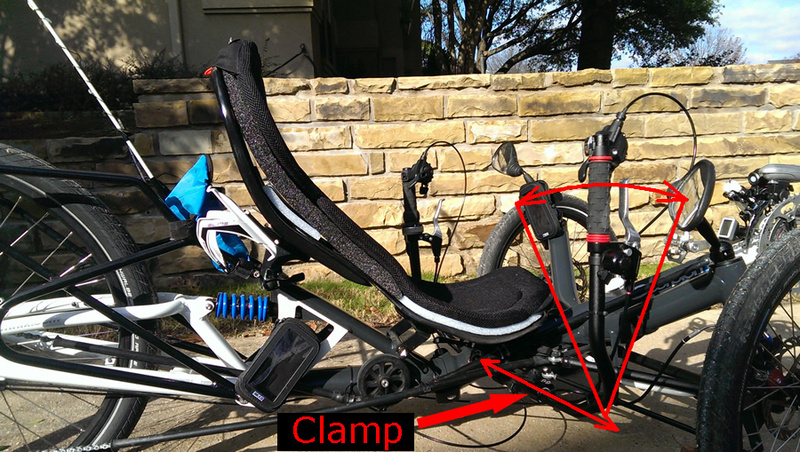 Some have separate left & right side clamps that allow the bars to move apart in the Span direction. The HPV lineup has extended bars as an available option to raise the Hand Grips. Shown here is the HPV Scorpion FS26 with 4" handlebar extension.